Plain bread in the dark. 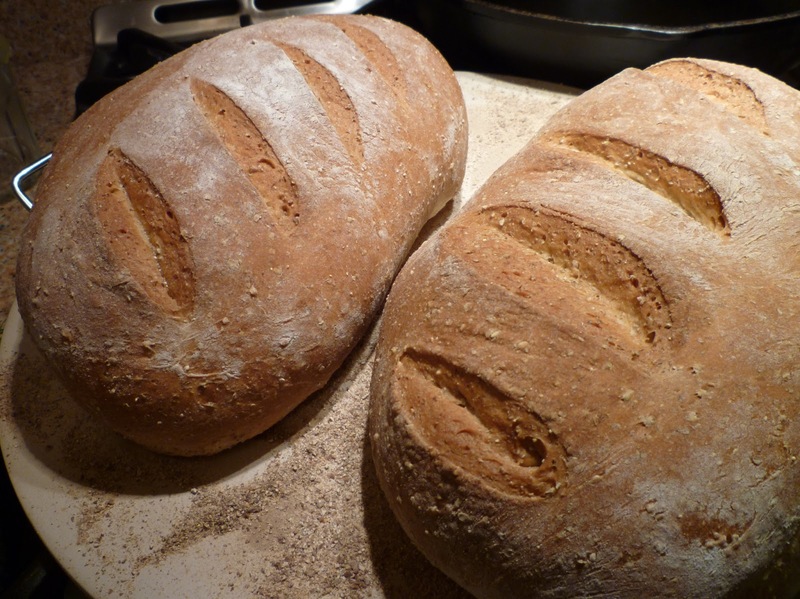 This time around I made a rather plain sourdough, which turned out to be even plainer than I wanted. 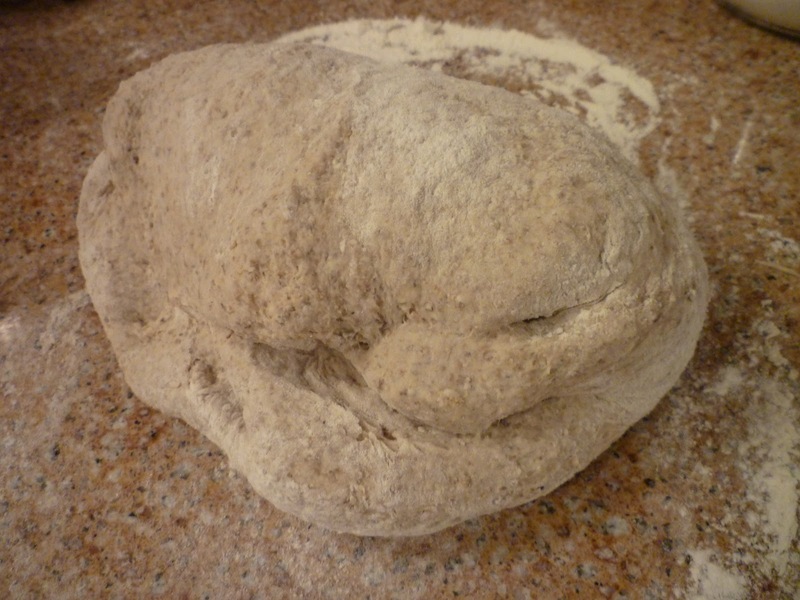 It was all unbleached wheat flour, no seeds or rye or anything exciting. I made a smaller batch that would produce two medium loaves, and originally hoped to get it done in two or three days instead of what’s been happening lately, where my sourdough sponge waits in the cold garage day after day till I can finally be home for a day to finish it. Thursday evening: Mixed the flour, water and starter in a bowl and left it covered on kitchen counter. Friday: Moved the bowl to the cold garage. 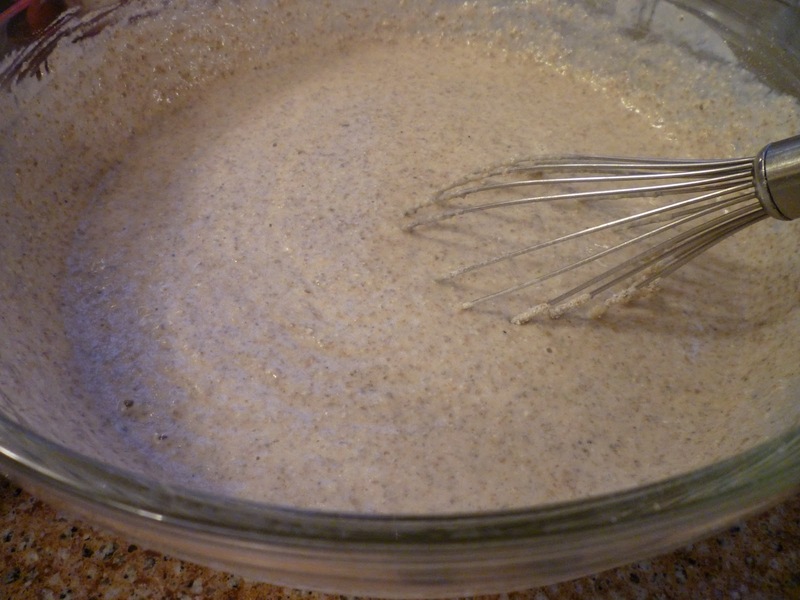 Saturday evening: added yeast, oil, salt and flour. Monday morning: Used a little flour to form two loaves, 1# 12 oz. each. Put them in loaf pans into a slightly warmed oven. Monday morning: The power went out. Monday all day: The loaves continued to rise slowly and I was assuming we’d have electricity in time to bake them. Nope, that was not to be the case. Monday evening: I had got a fire going in the wood stove, and began to realize that I’d need to bake the bread using that heat somehow. At first I thought I might put the pans right on the coals, but Mrs. Bread (haha, you would imagine she’d have good advice!) made me realize that it would be too much direct heat for aluminum pans. So I heated the cast iron Dutch oven on the narrow shelf of the stove for a half hour and sort of poured the two proofed loaves into it, and put the lid back on. I baked it about an hour, which I think was more than necessary. I wasn’t used to a loaf with all white flour, and in the light from the flashlight it looked greenish. Having no heat from above, it didn’t brown much on the top. While the bread baked I fried eggs for my dinner in a cast iron skillet on the other side of the stove. I got on a roll today in the kitchen, and made a huge happy mess. I really don’t mind cleaning up a kitchen – I especially like it when someone is cooking and I can just do the dishwashing for them. If I could be two people, I could cook up a storm as one GJ, and the other of me would gladly wash and dry and wipe counters. Doing all the jobs is complicated. I won’t get to bed early tonight! And I won’t have time to tell you about everything I cooked. Just the bread, for which I give credit to Jody. I read her blog post about sourdough baking, and it stirred again in me the urge to bake some chewy loaf and fill the house with that amazing aroma. I glanced at the clock and saw that I had just enough time to start and complete a bread project before bedtime, so I jumped up and opened the freezer, scooped some yeast into a bowl and started pulling out of my memory the beginnings of a batch that would make two loaves. 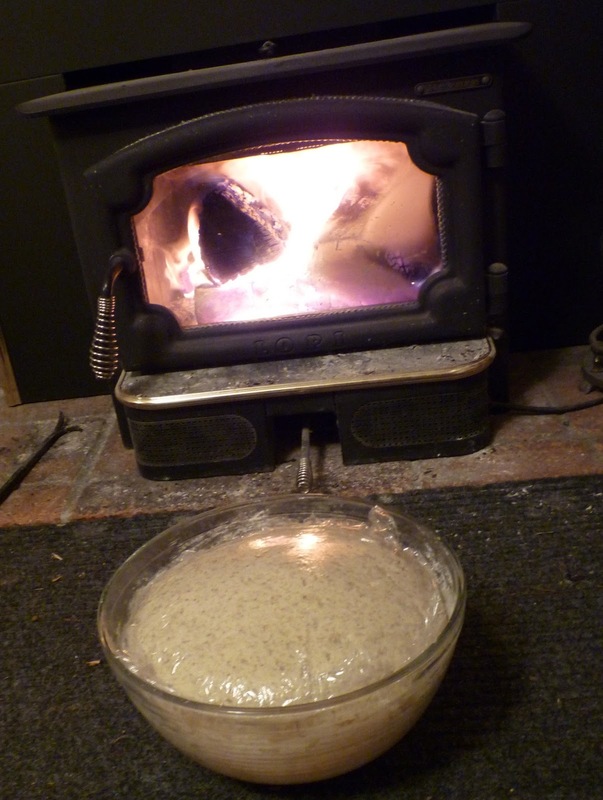 Eventually I ended up with a potato-rye sponge, and after it rose a few minutes I added enough wheat flour and other goodies to make a stretchy dough that rose further in front of the wood stove. I was using Giusto’s Pumpernickel Rye flour. A couple of years ago Soldier son gave me a pizza stone and I remembered just in time to get it out of the cupboard and use it to give the loaves an even chewier crust. They turned out so big, I think three round loaves might have been even nicer. Because of the kitchen mess I ran out of time to post the photos of everything I made, and I’m not even getting all the cleanup done. But I did take time to slice off the heel of one loaf and try it out. Success! 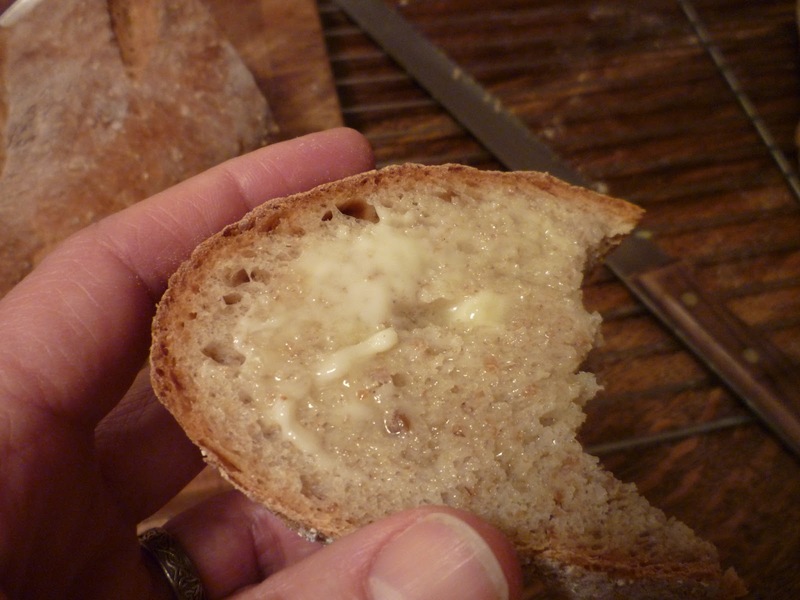 Tomorrow I’ll have to revisit the world of sourdough, too.